Go to www.thompsonminorhockey.ca. Select "create an account" at the top left and follow the instructions. Log into the Thompson Minor Hockey website, or the website you are a member of. Click on the link below that is of interest to you. At the top left of the screen beside your name click on "Become a Member". Once registered, click on the globe to the right of your username at the top to select the site you wish to visit. The Thompson Minor Hockey Association is currently accepting applications for Representative Coaches for the 2019-2020 Season. The TMHA strives to implement a program of excellence that focuses on skill development, technical skill, hockey knowledge and good sportsmanship. Application can be obtained at www.thompsonminorhockey.ca under "Coaching Resources" tab. 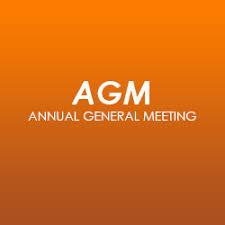 Please contact Greg Long - Vice President Technical at (204) 679-3145 or glongtmha@gmail.com for further information. SPORT MANITOBA 2018/2019 Regional Sport Development Grants Manual. Grants are available to help you & those in your community defray the costs associated with sports. Please click here to complete the Parent Respect in Sport Program. More information can be found at the Hockey Manitoba website. Rob Bassett - Peewee Director presenting Nathan Murphy with the Elaine Dymeterko Memorial Award - Most improved defenseman in Peewee House League. Rob Bassett - Peewee Director presenting Reed Scaddan with the Clifford Duchesne Memorial Award - MVP at Peewee "AA" Provincials. Dave Johnstone - Bantam Director presenting Tony Constant with the Ted Larson Memorial Award - Most sportsmanlike in Bantam House League. Mike Scaddan presenting Murphy Krentz with the Kevin Scaddan Memorial Award - Best display of skill, sportsmanship & academics in Thompson Minor Hockey. Coach Mark M'Lot presenting Logan Jeske with the TMHA Midget League Award - Exemplary display of sportsmanship & leadership through respect for their fellow players. Keith Burak presenting Jake McCusker with the Ken Burak Memorial Award - Most Sportsmanlike in Atom House League. 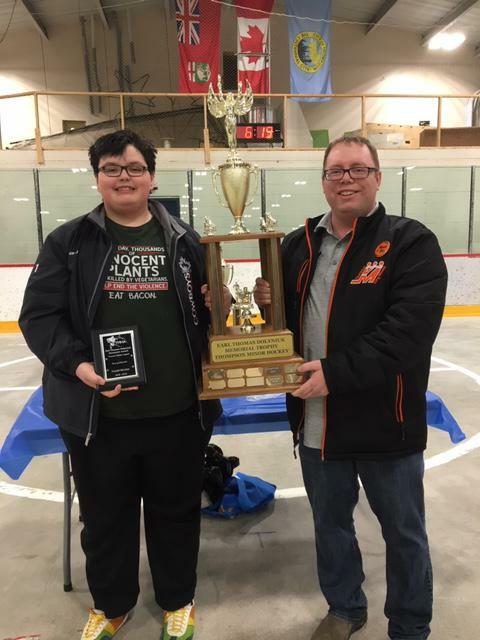 Rob Bassett - Peewee Director presenting Rydell Monias with the Earl Thomas Dolyniuk Memorial Award - Best goaltender in Peewee House League. Have you ever thought about playing hockey? How about playing with just girls? 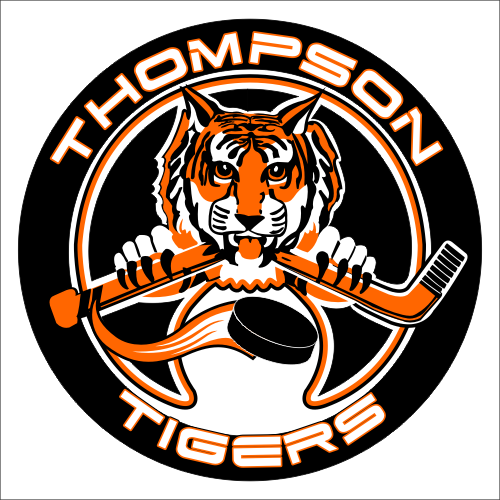 The Thompson Minor Hockey Association offers the Tigers Female program. 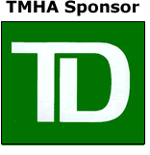 The program is open to players registered in our house league programs, AND … TMHA is excited to continue our GIRLS ONLY registration. This new registration will give you access to the female hockey program without having to play in the regular house league. You choose which option works best for you! The girls only registration is geared towards female players aged 9 - 17 looking to have fun in a non-competitive environment. Joining our Tigers program gives you access to one guaranteed ice time per week, with the opportunity to pick up additional ice times as they become available, and the opportunity to play in ALL-GIRL GAMES! For more information contact TMHA Female Coordinator. Carter Anderson is a house hold name in hockey arenas throughout Manitoba. And now he has taken his talent's South to the prestigious Hockey Academy RHA. A player with remarkable edge work, soft hands and an uncanny ability to find the back of the net. He is now fine tuning his game at RHA in Winnipeg. He will spend the next winter practicing daily and playing other well known prep schools throughout Western Canada. Good Luck Carter! Reach for the stars!